Blacks who identify with denominations in the evangelical (e.g. Southern Baptist Convention) or mainline (e.g. United Church of Christ) traditions are counted in the Religious Landscape Study as evangelical Protestants and mainline Protestants, respectively, not as members of the historically black Protestant tradition. While Muslims make up a relatively small proportion of both the U.S. general public and the black population, they (like Protestants) are more numerous among blacks (2%) than among the overall public (1%). Black men are significantly more likely than women to say they are Muslim (4% vs. 1%). 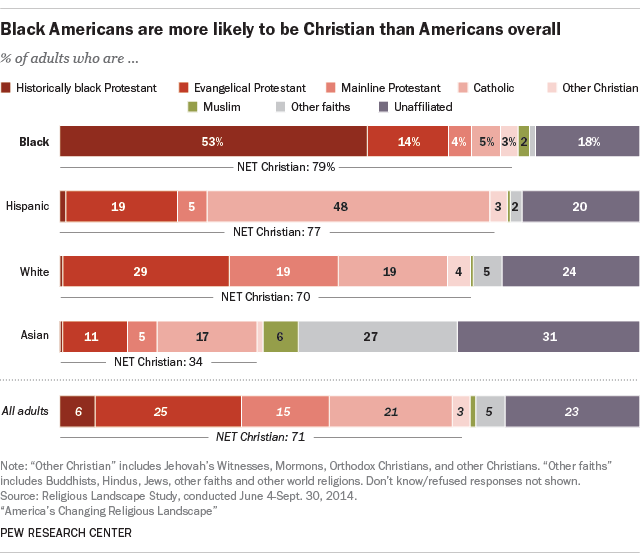 While blacks are more likely than whites to be Protestant or Muslim, they are significantly less likely to be Catholic. Only 5% of blacks say they are Catholic, compared with 21% of the public overall, including 19% of whites, 48% of Hispanics and 17% of Asian Americans. Blacks also are less likely than the U.S. public as a whole to identify as religiously unaffiliated – that is, as atheist, agnostic or “nothing in particular.” While 23% of the public identifies as unaffiliated, the share among blacks is 18%. This number, however, has risen among blacks and among the overall public. The share of African Americans who identify as religious “nones” grew by 6 percentage points between 2007 and 2014 (from 12% to 18%), similar to the increase among those in the general population (from 16% to 23%). Generational differences have been a key factor in the growth of religious “nones” as a share of the general population, and the same appears to be true in the black community. 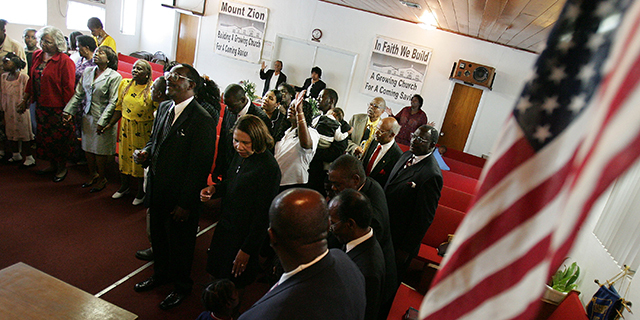 About three-in-ten black Millennials (29%) are religiously unaffiliated. By comparison, far fewer black Gen Xers (16%), Baby Boomers (10%) and members of the Silent and Greatest generations (7%) are unaffiliated. The survey also shows that black men are more likely to be religiously unaffiliated than women (22% vs. 14%). Again, this mirrors a trend among Americans in general.